Surgical Options - BROWN ANIMAL HOSPITAL, P.C. Drs. Brown, Shelton, and Gingras are all extremely competent surgeons with a combined 47 years of experience! 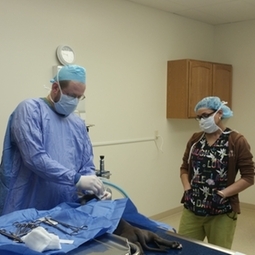 In addition to spays and neuters, they are accomplished in orthopedic procedures- including ACL repairs, luxated patellas and some fracture repairs. The clinic also offers and recommends pre-op screenings that can identify potentially harmful hidden conditions that could surface during surgery.